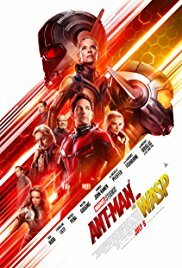 Paul Rudd, Evangeline Lilly, Michael Douglas, Michelle Pfeiffer, Michael Peña, Walton Goggins, Judy Greer, Bobby Cannevale, T.I . Harris, David Dastmalchian, Hannah John- Kamen, Abby Ryder Fortson, Randall Park, Laurence Fishburne. Paul Rudd’s Scott Lang must be the lowest-key superhero in the Marvel Universe. And, he spends a lot of his life and action as the diminutive Anti-Man? (though he does have some moments where he gets over-heightened, threatening boats and crowds at Fisherman’s wharf in San Francisco). However, he was welcomed by audiences in the original film, Ant- Man, enjoying the scientific experiments whereby he could be reduced, the work of the scientist, Hank Van Dyne, played by Michael Douglas. His daughter, Hope, also played a role (Evangeline Lilly). They are all back again, the film introduced with a prologue explaining how Hank’s wife, Janet (Michelle Pfeiffer) was reduced and went into a miniature world but disappeared and has been missing for 30 years. Hank wants to mount an expedition to go to rescue her. In the meantime, Scott has been in during two years of house arrest, an ankle bracelet for security, at home, playing with his young daughter, Cassie, and working with his associate in building up a security firm, Luis, played with comic enthusiasm by Michael Peña. The bulk of the plot has some straightforward action. Some thugs want to get hold of Hank’s laboratory – which, like humans, can be transformed into anti-size and resurrected to life-size. Walton Goggins leads the motley crew of thugs. So, a lot of time escaping with the laboratory, warding off the criminals, continuing with the plans for rescue, the police getting involved – but, most of all with Scott being able to escape house arrest by transforming into Anti-Man? and eluding detection and pursuit. However, this is an adventure, and it all catches up with Scott and his associates. This involves an elaborate car chase, the laboratory building suddenly coming to large life at San Francisco Bay, its going up and down – and a further complication that the daughter of a scientist-rival of Hanks has grown up able to move in in and out of space because of the reconstruction of her molecules! She is Ava/The Ghost, dangerous but potentially convertible. Of course, there is excitement in the rescue with Hank himself going to find his wife. The thugs are rounded up, the rather ingenuous policeman who is intrigued by Scott’s ability to do magic tricks and misdirected attention, reconciling with Scott – and, of course, a very happy Van Dyne family and Scott and his daughter. 1. Audiences liking the Marvel Universe? The connections amongst the characters? Ant- Man and Captain America? 2. Ant-Man as a latecomer to the universe? Lower-key? Fantasy and domestic aspects? 3. San Francisco, the landmarks, the Bay? The interiors, apartments, the FBI, police, offices, laboratories? The musical score? 4. The interior worlds, space, colour? Special effects? 6. The prologue, the back story, Hank and Janet, Hope as a little girl? The expedition, the risks, the farewells, Janet disappearing? The consequences for father and daughter, over the years, Janet a long absence? 7. Scott, his past, home prison in detention, the ankle bracelet, his foot through the wall, the police coming? His love for Cassie, playing with her, the elaborate slide in the house? The law, the police, the security? Luis and the firm, the contracts? The family relations, their turning up, taking Cassie, taking her to school? Cassie at school, the speech about the cup, grandma? Scott and his visit to the school to retrieve the cup? 8. Hank, his continuing his research, his hopes, lack of contact with Scott? Hope working for her father? The longing for Janet, working out ways to retrieve her? 9. The visit to Bill, the past story, rivalry with Hank? Ava, her father, his experiments, stealing from Hank, deaths? Ava and her transforming power? Her molecules all disassembled? Bill and his looking after her? Her becoming a government agent, working for SHIELD? Her life, the medical risks, short time to live? Bill to take care of her? 10. Sonny Burch, his thugs? Wanting to recover the building, the confrontations and threats, the chases, the truth serum, Luis telling all? The cars, the chase, the danger? Sonny and his getting the miniature building? 11. Ava wanting to abduct Cassie, Bill refusing, Ava and her pursuit, the cars, the reduction in the building, getting the remote? Janet’s return, Janet trying to help Ava? Restored to normal? 12. Scott and Hope, the past, the adventures, the plans, the laboratory, their being transformed to miniatures? To larger-than-life? The visit to the school, Scott in the closet, dressed as a child? In the laboratory, Scott becoming a medium for Janet but his not realising it? The plans for the expedition, the controls? 13. The expedition, Hank deciding to go, the dangers, in the in the space, meeting Janet, the reunion, Janet being transformed – the reunion, her saving Ava? 14. Scott, at home, the various devices, the substitute creature, in the bath, playing the drums? The jerkiness? 15. Scott, begin small, in the bay, large, the wharf, Hope and her rescue? 16. The police, intrigued by the magic, Scott and his ability to divert attention? The response of the officer? The cards? The finale and the patter about a date? 17. Luis, good friend, helping in the house, the company, covering the absences of Scott? Helping Hope, being small, in the cars, the pursuit? Truth serum? And the joke at the end with the thugs admitting the truth? 18. Happy ending, reunions? The jokes during the credits?